Systemic corticosteroids are often considered the treatment of choice in the management of severe drug-induced hypersensitivity syndrome (DIHS), also known as drug reaction with eosinophilia and systemic symptoms (DRESS) syndrome. However, in instances when systemic steroids are contraindicated, when there is an inadequate response to steroids, or when a prolonged course of steroids is not ideal, alternate therapies may be considered. Cyclosporine has been reported as a successful alternative immunosuppressive therapy; however, only a few cases have been reported in the literature. 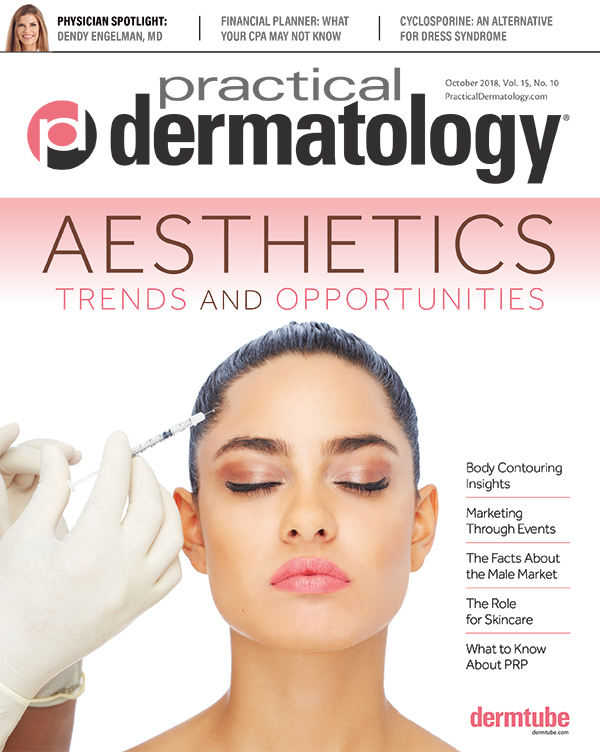 This observational case report presents an instance where cyclosporine was successfully used to treat DRESS syndrome in a patient where systemic steroids were ineffective. A 59-year-old man with a history of multiple myeloma was admitted to the hospital for a rash and new onset edema of the hands and face approximately five weeks after starting induction chemotherapy and antibiotic prophylaxis with trimethoprim/sulfamethoxazole (TMP/SMX). The patient developed numerous, coalescing, purpuric macules and papules, which covered most of his body (Figures 1a and 1b). The patient also had significant edema of the face and hands. The patient’s labs were notable for marked leukocytosis with hypereosinophilia and transaminitis with an alanine aminotransferase (ALT) of 212 and an aspartate aminotransferase (AST) of 54. A punch biopsy taken from one of the lesions was most consistent with a purpuric drug eruption. A clinical diagnosis of DRESS syndrome was made, his TMP/SMX was discontinued, and he was started on prednisone, 1mg/kg/day. Despite these interventions, the patient’s hepatic enzymes continued to rise and peaked with an ALT of 1,765 and an AST of 1,337. The decision was made to start cyclosporine 5mg/kg/day for a seven-day course, which resulted in rapid clinical and laboratory improvement (Figures 2a and 2b). The patient’s hepatic enzymes continued to trend down and normalized in approximately three weeks. NYU School of Medicine garnered headlines with its announcement that it is now offering full-tuition scholarships to all current and future students in its MD degree program regardless of need or merit. For enrolled students, that means a yearly savings of $55,018. Additional costs—including health insurance and room and board—currently equal about $27,000 annually. In announcing the new initiative, NYU cited data from the Association of American Medical Colleges (AAMC), showing that 75 percent of all doctors in the US graduated with debt in 2017. They note that the median cost of medical education (tuition and fees) for private medical school is $59,605 and the median current debt of a graduating student is $202,000. The move by NYU aims to increase access to medical education amid rising concerns that Americans may be on the verge of a significant physician shortage. In fact, data released by AAMC indicate that Americans may be short 120,000 doctors by 2030. The 2018 update of “The Complexities of Physician Supply and Demand: Projections from 2016 to 2030” shows demand far outpacing supply in both primary and specialty care. What do you think of NYU’s decision? Drug reaction with eosinophilia and systemic symptoms (DRESS) syndrome, also known as drug-induced hypersensitivity syndrome (DIHS), is fatal in approximately 10 percent of cases, most commonly due to hepatic necrosis.1 Diagnosis of DRESS relies on recognition of the syndromes’ clinical symptoms (edema, rash, lymphadenopathy, fever) and signs of hematologic or internal organ involvement in the laboratory data.2 Management of DRESS includes withdrawal of the suspected causative agent and supportive care.2 In cases of internal organ involvement, patients are also frequently prescribed a systemic immunosuppressant, most commonly corticosteroids.1 In instances when systemic steroids are contraindicated, when there is inadequate response to steroids, or when a prolonged course of steroids is not ideal, alternate therapies may be considered. 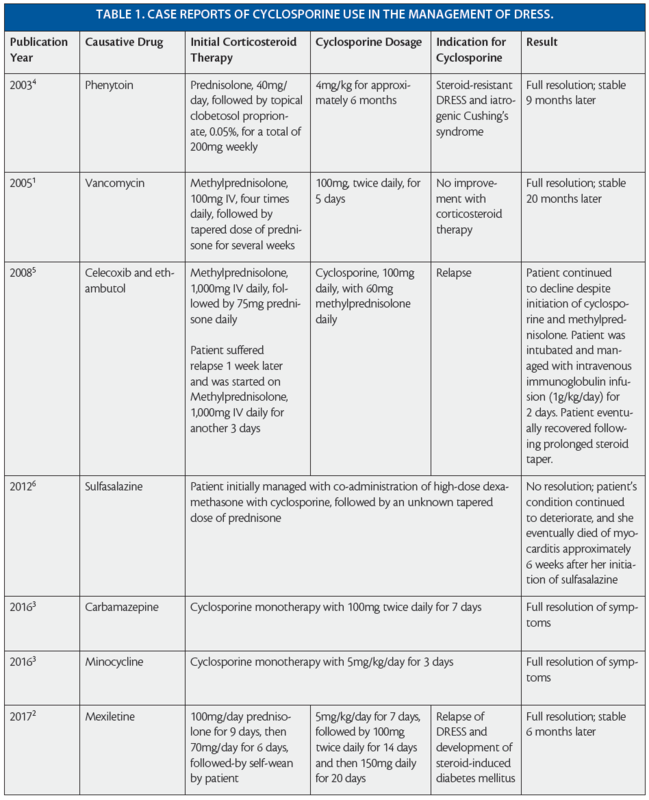 Review of the literature revealed seven other cases demonstrating the use of cyclosporine for the management of DRESS syndrome (see Table 1). In two of these cases, cyclosporine was effective as a first-line agent;3 in three others, it was used successfully as a second-line therapy after failed initial management with steroids.1,2,4 Finally, in two other cases, systemic corticosteroids followed by cyclosporine both failed to resolve refractory DRESS syndrome.5,6 This observational case report presents another instance where cyclosporine was successfully used in the management of DRESS syndrome and supplies further evidence that cyclosporine may provide an effective alternative or compliment to systemic corticosteroid therapy. Matthew S. Reedy, MD is a PGY-4 dermatology resident at Indiana University and Stephanie Kuschel, BA is in her final year of medical school at Indiana University and plans to pursue a dermatology residency. 1. Zuliani E, Zwahlen H, Gilliet F, Marone C. Vancomycin-induced hypersensitivity reaction with acute renal failure: resolution following cyclosporine treatment. Clin Nephrol. 2005;64(2):155-58. 2. Zhang ZX, Yang BQ, Yang Q, Wu M, Wang GJ. Treatment of drug-induced hypersensitivity syndrome with cyclosporine. Indian J Dermatol Venereol Leprol. 2017;83(6):713-17. 3. Kirchhof MG, Wong A, Dutz JP. Cyclosporine treatment of drug-induced hypersensitivity syndrome. JAMA Dermatol. 2016;152(11):1254-57. 4. Harman KE, Morris SD, Higgins EM. Persistent anticonvulsant hypersensitivity syndrome responding to ciclosporin. Clin Exp Dermatol. 2003;28(4):365-65. 5. Lee JH, Park HK, Heo J, Kim TO, Gwang HK, Kang DH, et al. Drug rash with eosinophilia and systemic symptoms (DRESS) syndrome induced by celecoxib and anti-tuberculosis drugs. J Korean Med Sci. 2008;23:521-5. 6. Daoulah A, Alqahtani AA, Ocheltree SR, Alhabib A, Ocheltree AR. Acute myocardial infarction in a 56-year-old female patient treated with sulfasalazine. Am J Emerg Med. 2012;30(4):638.e1-3. Stephanie Kuschel, BA is in her final year of medical school at Indiana University and plans to pursue a dermatology residency. Matthew S. Reedy, MD is a PGY-4 dermatology resident at Indiana University.